Influencer marketing is an increasingly popular form of marketing based on the concept that people are more likely to buy a product or a service influenced by the recommendation of an influencer. It focuses on identifying individuals with influence over potential buyers and orientates marketing activities around these influencers. This influencer can be a friend or family member, or a so-called value-added influencer, such as a celebrity, journalist or industry expert. In fact, in a 2017 survey among brand strategists and marketers regarding the role of influencer marketing in an organization, 58 percent of respondents expressed a belief that influencer marketing will be integrated in all marketing activities within the following three years. Influencer marketing has indeed proved to be a valuable tool for marketers. In the health and pharma industry, for instance, it was found that owing to influence marketing programs, marketers received, on average, about 21.25 U.S. dollars of value for every dollar they spent on paid media. In 2017, the average for all industries stood at 12.21 U.S. dollars for every dollar spent. Some of the leading goals of influencer marketing include: improvement of brand awareness, reaching new target audiences, and increasing sales conversion. And so, about 30 percent of marketing professionals state that they have worked with one to five influencers on their campaigns. In light of the potential of influence marketing, some 39 percent of marketers in the U.S. stated they expected an increase in their 2018 budgets devoted to influencer marketing. While user generated content has grown to be a digital resource with the largest shopping influence, social media has also come to be one of the major components of influence marketing as some of the their perceived benefits include: increased exposure, increased traffic, developing a loyal fan base, generating leads, as well as provision of marketplace insights. 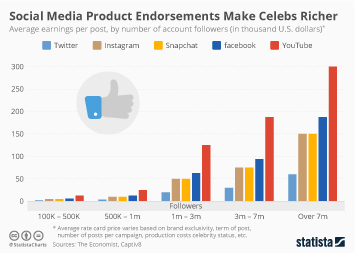 In terms of platforms used by social influencers for brand collaboration, the latest focus is placed on Instagram, followed by blogs, YouTube, Facebook, and Pinterest. Social video is also one of the main media of influencer marketing, where Facebook takes the lead in share of influencer-generated posts, followed closely by YouTube. In fact, non-live videos were the leading type of branded posts on Facebook as of August 2017. Seeing as approximately a third of consumers claim to discover brands via those channels, it is safe to say that the potential for growth makes influencer marketing a worth-while investment. Most often used influence marketing success measurement metric in the U.S. in 2017 Engagement Platform perceived by marketers as most effective for influencer marketing in the U.S. in 2015 Blog Most effective influence marketing tactics in the U.S. in 2016 Ongoing ambassadorship Factors keeping followers engaged according to influencers in the U.S. in 2016 "I am myself, honest, funny, open, willing to call it like I see it"